Plans to build a heritage railway line through the coalfields where the 1984 miners' strike began have taken "a major step forward", enthusiasts say. 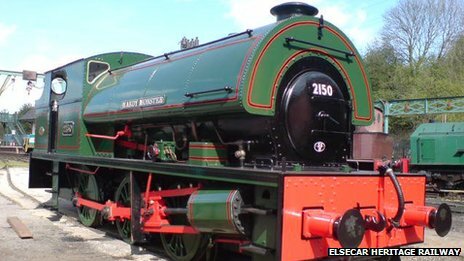 Funds have been raised to construct a level crossing allowing the Elsecar Heritage Railway (EHR) in South Yorkshire to be doubled in length. This means trains will eventually be able to travel between Elsecar and Cortonwood, where the mining dispute began. The EHR hopes to re-brand the 2.5-mile (4km) route as the Coalfield Line. Before the level crossing was built the existing 1.25-mile (2km) line stopped at Hemingfield. The new crossing is the first step in a plan to connect Elsecar to Cortonwood. Its opening will be marked by the first locomotive crossing of Tingle Bridge Lane, near Hemingfield, for more than 30 years. William Tilling, from the EHR, said: "This is such a major step forward." Mr Tilling, chairman of trustees at the EHR, said he hoped to extend the line by a further 1.25 miles to Cortonwood and build a new station called Cortonwood Colliery Station. "Without this crossing it has been a bit like the Berlin Wall or the Red Sea," he said. "Without it we would not have been able to fulfil our ambition to become the Coalfield Line and to be able to tell the story of South Yorkshire's coalfields because Cortonwood is totally pivotal to that story." Plans to close the mine at Cortonwood sparked the miners' strike. Mr Tilling said trustees wanted to build a museum and memorial garden nearby to commemorate the strike and mark the 1866 Oaks Pit mining disaster which killed 361. Work to extend the line and develop the Cortonwood site is expected to cost up to £220,000. Funding for the crossing and improvements to Elsecar station was raised by volunteers and from donations.